The aims of this research is was to find out the profile of overall science critical thinking ability and based on the gender of viii grade students of SMPN at Ende city. This research was a descriptive research. The population of this research were all the VIII grade students of SMPN at Ende city academic year 2017/2018. As many as 804 students and the sample were 10% of the populations, they were 80 students. This research used random sampling technique. The data were obtained from the score of science critical thinking ability. The data were analyzed by using descriptive analysis. the result shows that the average of science critical thinking ability of students was 66,84 which is categorized as medium or critical enough. Meanwhile, based on the gender perspective, the female group obtained the average as 68,56 which is categorized as high or critical. Meanwhile, male obtained the 62,03 which is categorized as medium or critical enough. Aksani, L.,& Purwanto, J. (2015). Meningkatkan kemampuan berpikir tingkat tinggi mahasiswa pendidikan matematika UMP melalui model Project Based learning pada mata kuliah kalkulus lanjut I. Journal Mathematics Education AlphaMath,1(1), 45-49. Asta, I. K. R., Agung, A. A. G., & Widiana, I. W. (2015). Pengaruh Pendekatan Saintifik dan Kemampuan Berpikir Kritis Terhadap Hasil Belajar IPA. MIMBAR PGSD Undiksha, 3(1). Ennis, R. H (1996). Critical Thinking. USA: Prentice Hall, Inc.
Gregory, R. J. (2000). Psycologycal testing, history,principles, and applications. Boston: Allyn & Bacon, Inc.
Guiler, J., Ross, A., & Durndell. (2005). The role of gender in a peer based critical thinking task. Departement of Psychology, Glasgow Caledonian Unversity. Glasgow, Scotland UK. Hadi. (2009). Pengaruh Penggunaan Laboratorium Riil dan Laboratorium Virtuil pada Pembelajaran Fisika Ditinjau dari Kemampuan Berpikir Kritis Siswa. Tesis. Tidak Dipublikasikan. Surakarta: Universitas Sebelas Maret. Harso, A., & Kaleka, M. (2014). Analisis kemampuan berpikir pada soal-soal UTS IPA yang disusun oleh guru-guru IPA SMP Sekota Ende. Laporan hasil penelitian. Program Studi Pendidikan Fisika FKIP Universitas Flores Ende. Tidak dipublikasikan. Johnson, E. B., (2002). Contextual teaching and learning: what it is and why it’s here to stay. United States of America: Corwin Press, INC.
Maulana. (2008). Pendekatan Metakognitif Sebagai Alternatif Pembelajaran Metematika Untuk Meningkatkan Kemampuan Berpikir Kritis Mahasiswa PGSD. Jurnal penelitian Pendidikan, 8(1). 21-28. Myers, B.E., & Dyer, J.E. (2006). The Influence Of Student Learning Style On Critical Thinking Skill. In Journal of Agricultural Education, 47 (1), 43-52. Nurkancana, W., & Sunartana, P.P.N. (1992). Evaluasi hasil belajar. Surabaya: Penerbit Usaha Nasional. Pambudiono, A., Zubaidah, S., & Mahanal, S. (2013). Perbedaan Kemampuan Berpikir dan Hasil Belajar Biologi Siswa Kelas X SMA Negeri 7 Malang Berdasarkan Jender dengan Penerapan Strategi Jigsaw. 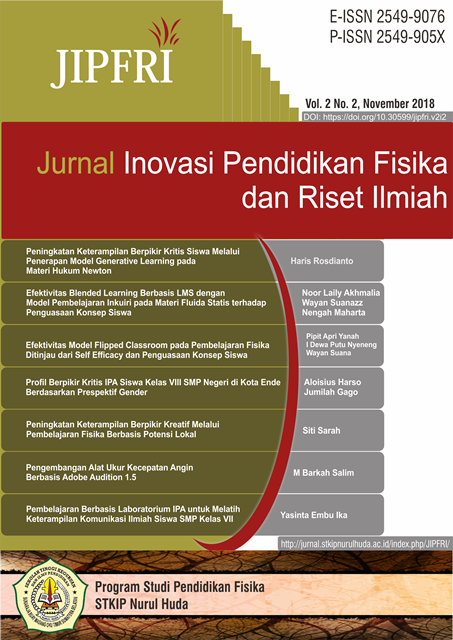 Jurnal Pendidikan Hayati, 1 (1). Ricketts, J.C., & Rudd, R. (2004). Critical Thinking Skills of FFA Leaders: Journal of Southern Agricultural Education Research, 54 (1), 21-33. Sadia, I W., Subagia, W., & Natajaya, I N. (2009). Pengembangan model pembelajaran dan perangkat pembelajaran untuk meningkatkan keterampilan berpikir kritis (critical thinking skills) siswa Sekolah Menengah Pertama (SMP) dan Sekolah Menengah Atas (SMA). Laporan Penelitian (tidak diterbitkan). Jurusan Pendidikan Fisika Universitas Pendid ikan Ganesha. Schafersman, S. D. (1991). An introduction to critical thinking. Tersedia pada http://www.freeinquary.com/critical-thinking.html. Diakses tanggal 27 januari 2018. Sasser, L. (2010). Brain Differences between Genders. Gender Differences in Learning, Genesis 5,1‐2. http://www.faccs.org/assets/Conventions/Convention10/Workshops/Sasser-Gender-Differences-in-Learning.pdf, diakses tanggal 13 Maret 2017. Semerci, C. (2005). The influence of the critical thinking skills on the Students’Achievement. Pakistan Journal of Social Sciences, 3(4), 598-602. Yousefi, S., & Mohammadi, M. (2016). Critical Thinking and Reading Comprehension among Postgraduate Students: The Case of Gender and Language Proficiency Level. Journal of Language Teaching and Research, 7(4), 802-807, July 2016. http://dx.doi.org/10.17507/jltr.0704.23. William, J.D. (2011). How science works: Teaching and learning in the science classroom. Chennai: Continuum.